When I was growing up in England, pickled eggs were a popular snack in local pubs. I remember seeing them on the bar in huge jars. Along with meat pies, Cornish pasties and sausage rolls, they go down well with beer. I can’t remember if I ever tried one back then. An old family recipe for 3 dozen eggs was sent to me by brother David who lives in Vancouver. Actually it came to me via my sister who lives in the UK. Thirty-six eggs seemed like a lot, so I decided to divide the ingredients by three and pickle 12. Traditional British recipes use malt vinegar and a little treacle so the eggs gradually take on a blackish hue. David says any vinegar will work, so I used balsamic. A bit upmarket for your average British pub – I don’t think anybody had heard of balsamic vinegar when I was growing up. I buy large 865g jars of Maille Dijon mustard from Costco and found that twelve eggs fit perfectly in one of those jars. Our verdict? They’re a bit of an acquired taste but a good addition to a ploughman’s type lunch. Place the eggs in a jar with a lid that they fit into snuggly. Place remaining ingredients in a saucepan, bring to the boil and simmer for 3-5 mins. Pour over the eggs. Add extra vinegar to cover completely. Close the jar and invert to mix well. Keep for about a month before using. I grew up on a fairly basic British diet of meat and three veg. However, my mother was a British Army kid and while living in Hong Kong and Malta she was exposed to some “foreign dishes”. She had two in her repertoire – Spaghetti Bolognese and Kedgeree. Nowadays these dishes are familiar to most people, but when I was a child they were pretty unusual to find in a British household – unless of course you were “foreign”, which we weren’t. When one of my school friends came round for dinner and Mum served one of these my guest would push the food around the plate and eat very little. No doubt about it, back then this was weird food. 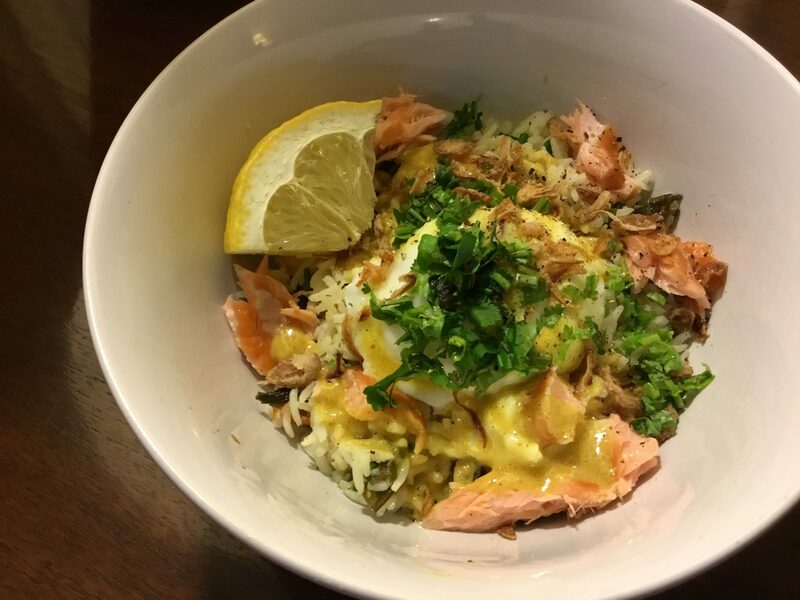 You can find my mother’s recipe for Kedgeree along with an Asian variation here. I found today’s version in an airline magazine some years ago and have been meaning to make it ever since. I have a huge folder and an email box dedicated to recipes I plan to make one day, so I don’t think I’ll ever run out of inspiration for this blog! Place rice in a saucepan with a little more than one and a half cups of water and a teaspoon of salt. Bring to the boil then cover and turn down heat as low as possible. Cook for 10-15 mins, or until water has been absorbed. Turn off the heat and leave it to continue cooking in the steam. Poach the eggs. Break the hot smoked salmon into large chunks and mix into the hot rice with the butter or olive oil and chives. Season to taste. To serve, divide rice between four bowls. Top each serving with a poached egg and some Curry Sauce. Garnish with coriander, crispy shallots and a lemon or lime wedge. Note: I used spring onions rather than shallots and decided to pass the sauce through a sieve to remove the bits. I mixed these bits into the rice, so they weren’t wasted. I just thought the sauce looked nicer without them. After sieving the sauce I reheated it to serve. Frittatas are Italian omelettes. They make a delicious hot meal and any leftovers are perfect cold for lunch next day. Wash vegetables and cut into 2.5cm (1 inch) lengths, discarding the tough ends. Heat butter in a 25cm (10 inch) cast-iron or non-stick frying pan. Add the asparagus, broccolini and garlic and season lightly with salt and pepper. Stir fry for 3-4 minutes. Meanwhile beat the eggs and season lightly. When the vegetables are cooked and starting to brown, add the eggs, pulling in the sides with a spatula as they cook, as you do with an omelette. When the frittata is mostly set, sprinkle the Parmesan over the top. Turn off the heat then either put the pan under a hot grill for a minute or so, or cover it with a lid and let it stand for for a minute or so. This is to set the top. 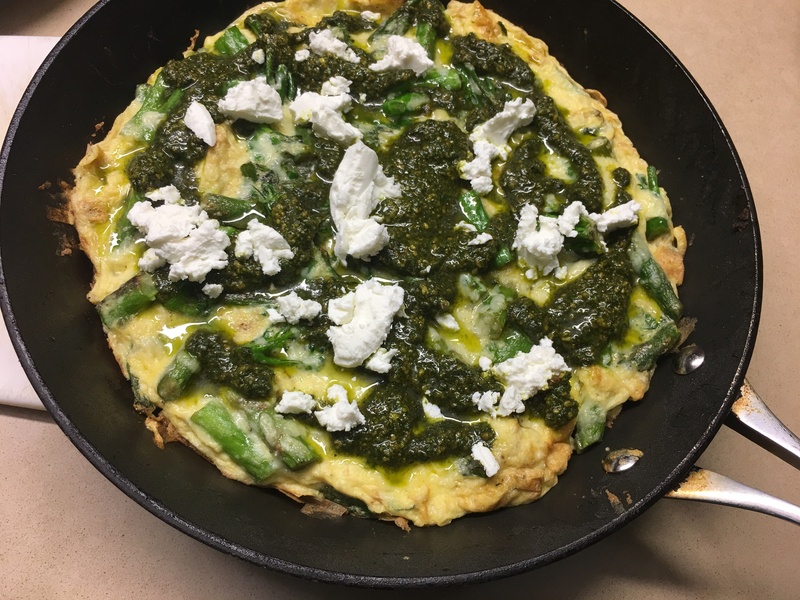 Mix enough olive oil into the pesto to make it pourable then drizzle over the top of the frittata. Top with the crumbled cheese. Cut into wedges to serve. If you’re a regular reader of this blog you will have noticed that we like to give meat and fish a rest about once a week and go vegetarian. A frittata is an egg-based Italian dish, similar to an omelette. 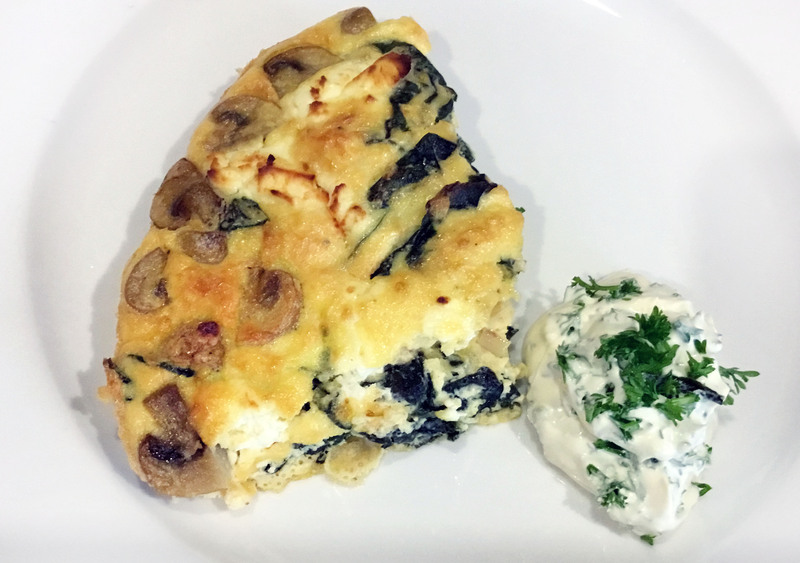 A vegetable frittata makes a tasty light supper and any leftovers are nice cold the next day. Choose a medium sized non-stick frying pan (mine is 25 cm or 10 inches) with a metal handle, so it can go in the oven. When the frittata comes out of the oven the metal handle will be very hot. I forgot and have the blisters to show for it. Heat half the butter and oil in the frying pan and cook the mushrooms and garlic over moderately high heat for 2 minutes, stirring, then transfer to a bowl. Strip the spinach from the stalks and discard the stalks. Tear the spinach into smaller pieces. Add to the frying pan with the remaining oil and butter and cook, stirring, for 2 minutes until wilted. Add to the bowl with the mushrooms. In another bowl using a balloon whisk beat the eggs, sour cream, lemon juice and rind, grated Parmesan and salt and pepper. Pour into the frying pan, Scatter the spinach and mushrooms and any juices over the top. Place small pieces of goat’s cheese or feta all over the top. Place back on the stove until the frittata starts to set, then bake for 10 minutes, or until puffed and golden. Cut the frittata into wedges and serve with a mixed salad and the sour cream sauce. Sour Cream Sauce: mix sour cream with chopped parsley. This Anchovy Butter is amazing. Serve it on steaks or fish, on steamed vegetables, on toast under scrambled, soft boiled or poached eggs or mixed into pasta. It keeps for up to a month in the fridge. Place all ingredients in food processor and mix until smooth. Place in a small bowl and dust with paprika. Keep refrigerated. I like eggs cooked any way at all – boiled, scrambled, poached, coddled or in an omelette or frittata. 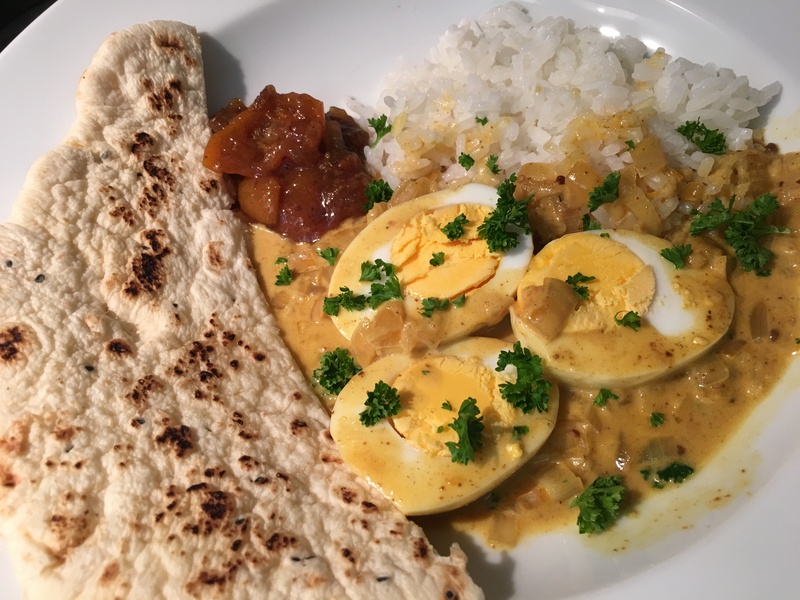 Many years ago when we were living in Malaysia we were served some delicious curried eggs. 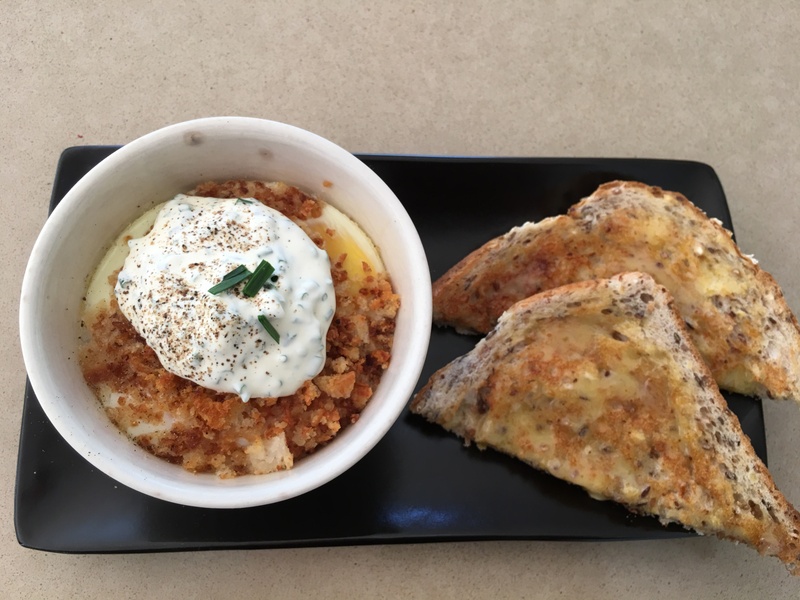 The memory has stuck in my mind, so I decided to recreate this quick, easy and delicious dish. If there are just two of you the quantities are easy to halve. You want the eggs to be hardboiled, but don’t overcook them or they won’t be nice and creamy. About 12 minutes should be perfect. In a large frying pan cook onion and garlic in the oil until soft, without browning. Add curry paste, sugar and turmeric and cook, stirring for a minute or so. Add coconut milk and water and simmer until liquid has reduced and sauce is slightly thickened. Add salt and pepper to taste. Add the hardboiled egg halves, cut side up and let them warm through. Garnish with coriander or parsley and serve with rice, Indian bread and chutney. This recipe from a website called Food52 is so simple you hardly need a recipe. But it’s such a novel idea and so delicious I had to tell you about it. 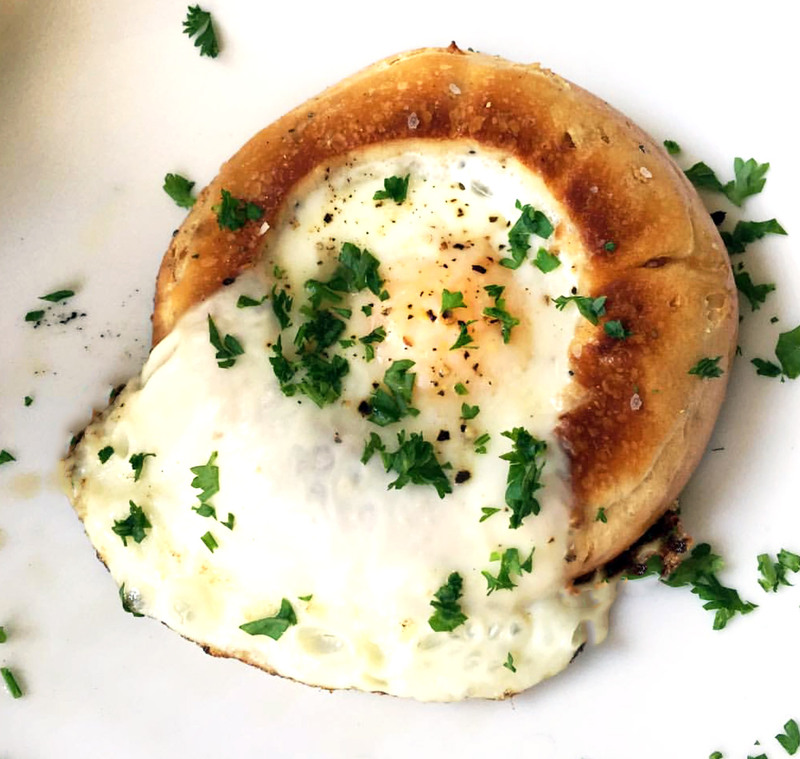 You simply fry an egg in the hole in half a bagel. Serve for breakfast or lunch, accompanied by bacon, ham, smoked salmon or on its own. The recipe makes two servings, but you may decide to eat them both! They go very well with leftover ham from Christmas. Make the holes in the two halves a bit bigger using a serrated knife or a small scone cutter. Heat butter in a non-stick frying pan and swirl around. Place bagel halves in the pan, cut side down, break an egg into each and season with salt and pepper. It doesn’t matter if it spills out a bit. Cover and cook until the eggs are just set. Serve alone or with crispy bacon, ham or smoked salmon. If serving with bacon cook it in the pan first, then remove and cook the bagel so it gets a nice bacon flavour. When we lived in Pretoria in the late 1980s we found a fabulous French restaurant called La Madeleine. There was no written menu so Belgian chef-owner Daniel Leusch would come to each table and explain what was available that day. His Lyonnaise Salad was introduced in the following way. And so he would go on until he had described everything and we were left, drooling, to make decisions. It’s twenty-five years since we left Pretoria but La Madeleine is still going strong, with Daniel and his wife Karine’s daughter Anne in charge of the kitchen. 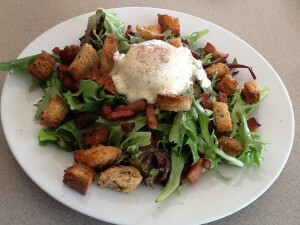 Since then my version of Daniel’s Salade Lyonnaise has become one of my favourite lunches. But you do have to be in the kitchen at the last minute, so I usually only make it for two, maximum four people. 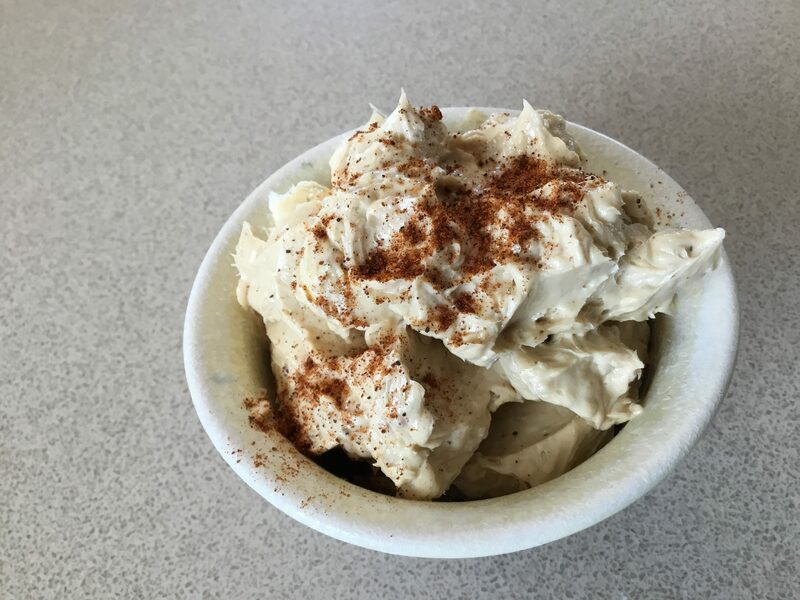 If you don’t have time to make Hollandaise Sauce substitute mayonnaise, preferably home-made. For hungry people serve two eggs instead of one. As it’s one of the signature dishes of the French city of Lyon I ordered this salad in three different bistros while we were staying there a couple of years ago. What a disappointment! Soggy bacon or croutons, over-cooked eggs and indifferent salad greens meant that none of them lived up to their reputation. Take me back to Pretoria any time! For Hollandaise sauce place butter in a small bowl and microwave for 30 secs. With a small hand whisk, beat in yolks, then cream and lemon juice. Microwave for 45 secs, stopping to beat every 10-15 secs. This is important to avoid scrambling the eggs! Season then cover and keep warm by standing the bowl in a larger bowl containing hot water. Brush both sides of bread with olive oil, cut into croutons then either bake in a hot oven on a tray lined with baking paper for 5-10 mins or fry in a non-stick frying pan until golden and crunchy. Meanwhile poach eggs until done – whites firm, yolks still soft. While they are cooking, prepare the lardons – cut bacon into thick slices, then into little chunks. Fry in a non-stick frying pan with a tiny bit of oil and drain on paper towels. Place all ingredients for the salad dressing in a screw top jar and shake vigorously. Mix salad greens with some dressing (see note below) and divide between 2 plates. Place a poached egg in the centre and spoon some Hollandaise sauce over. Sprinkle the croutons and lardons around the egg. Note: Any unused French dressing will keep for up to a month in the fridge so I often make double or triple the recipe. Don’t crush the garlic, just cut it in half, so the flavour isn’t overpowering. The French wouldn’t put honey in their dressing (I love it especially as I keep my own bees!) so if you want to be authentic leave it out. The Parlour Wine Room in New Acton Canberra has a great lunch menu at the moment where you can choose a main course from a selection of about half a dozen options for just $16, including a glass of wine or beer. I chose Spanish Eggs and it really hit the spot. 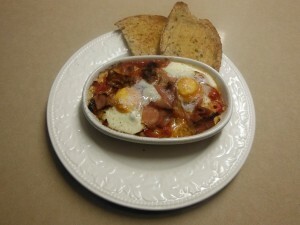 The servings were quite large – I think there were 3 or 4 eggs per serve – so I have cut back a bit in my version. If you’re hungry this recipe will serve two rather than four. Jamon is the Spanish word for ham and usually refers to dry-cured hams. Substitute Italian prosciutto or German black forest ham. I used the latter from Aldi. Heat oil in a frying pan and add the onions. Fry gently until softened then add the capsicum strips. Continue to fry gently for 15-20 minutes, stirring often. Add half a cup of water and continue to cook until the liquid has evaporated and the mixture is soft. Can be pepared to this stage and kept in the fridge until needed. Preheat oven to 180ºC. Divide onion and capsicum among four individual oven-proof shallow dishes. Break two eggs into each dish and top with the ham, cut with scissors into pieces about 2-3 cm long. Bake for about 8 minutes, or until eggs are set and ham is crispy. Season with salt and pepper. For a low carb meal skip the toast! Serve with buttered sourdough toast on the side.